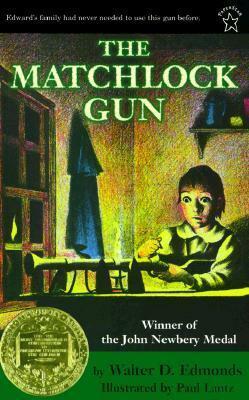 The Matchlock Gun is a very short novel published in 1941, which takes place in Guilderland, New York in 1757. The Van Alstyne family, who are the characters of the story, were real people, and the events of this book, which occur during an Indian raid of their home, really happened. The Matchlock Gun tells of the night when young Edward Van Alstyne is left alone in the house with nothing but an old Spanish gun to defend himself. Will Edward have the courage and strength to fire the gun if needed? And if he does so, what will be the end result? This is a book about one boy during a very difficult moment, both in history, and in his own life, and it invites young readers to put themselves in Edward's shoes and consider what they would do in the same circumstances. There are quite a few predictably shortsighted reviews of this book on Goodreads complaining that it is racist because it focuses on fighting between white people and Indians (and because there is some passing, historically accurate, discussion of slavery which is not immediately condemned). Personally, I think this is an overreaction. By relating one particular true incident that occurred during a conflict between Indians and Dutch settlers, this book doesn't really make any commentary at all on all American Indians as a group, or even on Edward's actions toward Indians in the story. The ending of the book is actually left very open-ended, with lots of room to discuss any problems the reader may have with the text. Perhaps this is uncomfortable for some people, who worry that kids will come up with the wrong interpretation if left to figure things out on their own. But I like that the author leaves the reader just after the story's climax. This helps the reader to hang onto the emotions he feels as the action is happening and to react to them strongly while still in the moment. It also allows kids to think critically for themselves about any race issues there may be in the book. The writing in this book felt a little spare to me at times, and the illustrations, too, seemed to interrupt the text more than supplement it at some points, but these are also not reasons to dismiss the book, to weed it from libraries or to stop using it to teach American history. This book is valuable for its exceptional quality of writing, its insight into a small, true incident in which a child shows remarkable courage, and its representation of the type of books that were considered excellent by librarians of the 1940s. (It won the 1942 Newbery Medal.) I find it distressing that libraries remove it for fear of offending 21st century audiences, when the politically correct and hyper-offended culture of today could not have even been imagined 75 years ago. I can appreciate the book for its historical significance without agreeing with everything that happens in it - I would hope others can as well. I am sure my kids will read this book when they are the appropriate age, and I look forward to the insightful conversations I am sure we will have as a result. I finished the book easily in one sitting, and I would happily read it again. When I worked in the library, I always kept award winners on the shelves no matter how often they had (or had not) been checked out. But I know many in the profession would say this was wrong for me to do. Either way, we have a growing collection of Newbery titles we have bought used just in case the libraries have done away with them by the time my kids are old enough to enjoy them. I don't want them to miss out just because the books aren't popular anymore.